For once ERW isn't wearing a suit. I like the dress. I like Tina's too. That is the first miss (for me) as far as what Constance Wu is wearing - I've loved most of hers this past month. 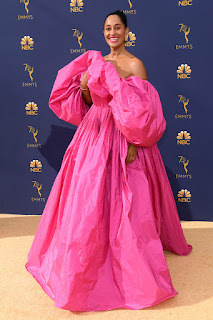 Really do not care for Tracee's dress. She is tall and slim, why hide under all those clothes! Her mom did the same. Oh Tracee...fire who picked that dress out. This round is won for the ladies by Rachel Brosnahan, so subtly elegant, but Gwendoline Christie gets honorable mention, such a fun look on her. 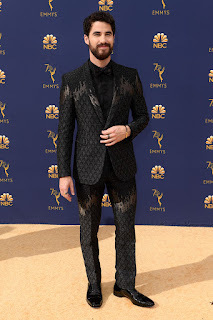 For the men, Darren Criss only by default, nothing subtle or bold there with that mishmash although the lines are nice. ERW as always looks like she'd f*ck you up. Darren Criss: "hey does my suit look too boring?" Designer: You're good to go now Darren." Darren Criss: " Thanks, hun, you're the best!!!" (Kisses cheek, swishes out to the limo).